Volkswagen could be forced to recall thousands of cars, after a cancer-causing metal was found in a number of its plug-in models. 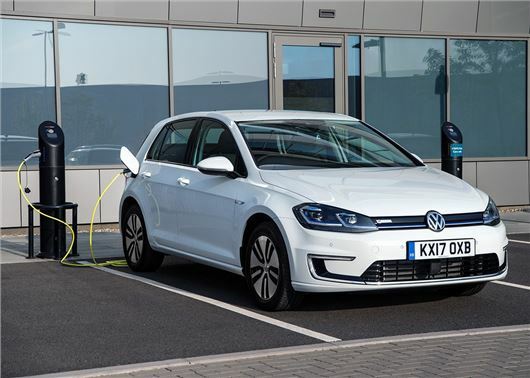 Battery chargers in some (but not all) Golf GTE, e-Golf, Passat GTE and e-Up models have been found to contain a poisonous metal called cadmium, which has been linked to a range of lung conditions that include cancer. The metal was fitted by a third party company, which builds part of the high-voltage charging unit for Volkswagen. Volkswagen insists that the original material data sheets submitted by the supplier did not contain any information on the use of cadmium and it is now in the process of investigating how it came to be present. The third party organisation no longer builds components for its plug-in models. A Volkswagen spokesperson told HonestJohn.co.uk that the issue will not cause any harm to the public, owing to the fact that the small amount of cadmium - 0.008 grams per battery charger - is housed within a sealed unit. However, the presence of cadmium could cause problems when the vehicle is scrapped, recycled or dismantled. It isn’t known how many electric and plug-in Volkswagen cars are affected by the problem, but the issue could span all models that have been built over the past six years and include some electrified Audi and Porsche models. In a statement, Volkswagen said: ‘We informed the German Federal Motor Transport Authority (Kraftfahrt Bundesamt KBA) verbally in advance on 12 July and in a written statement on 20 July 2018 that cadmium (0.008 grams per battery charger) was, in addition to silver, used to a small extent in a relay of the high-voltage battery charger from a specific supplier for the coating of electrical contacts. ‘Cadmium is a material recognised in the electrical industry, which is used to harden surfaces and is found in a large number of electrical appliances (e.g. televisions). This is classified as permissible in the corresponding REACH and ROHS EU Directives from 2006 and 2011. ‘The relevant relay is installed in a fixed housing inside the battery charger, which itself is enclosed in a fixed housing. This enables Volkswagen to ensure that no cadmium can be released into the environment and that no consumer or service technician can come into contact with it. What a load of codswallop. Nickle/Cadmium (Ni/Cad) rechargeable batteries have been around for years, mainly superseded by NiMH (Nickle Metal Hydride) and probably even more efficient batteries as technology advances. Anything is probably poisonous or cancer causing if you eat enough of it or indulge in great big sniffs of any emissions and I suppose there some really stupid people about. It gives carte blanche to the so-called "Safety Experts" who will make a killing with outrageous charges like they have done with Asbestos scam. What statistics are available showing how many people have died already as a direct result of cadmium who would have died from other causes any way like smoking or inhaling brake dust? At least it's a German car and VW don't need any more bad news after the emission uproar. Wait for the Trolls!!! Engine oil is laced with cadmium, and as such any person living near busy motorways etc. will have higher levels in their bodies, from exhaust gases. It collects in one’s liver, has as an isotope a fairly short half life, and breaks down into a more radio active derivative inside us , and stays permanently. There really isn’t anything much more highly destructive to us, short of raw chlorine ! As a retired electronics engineer I am amazed at this reaction. Cadmium has been in use for many, many years in the electronics industry as an essential element in many electronic components. The amounts used are very, very small and for it to cause any real harm would need someone to ingest thousands of the components - but they would be unlikely to cause harm as the elements are encased in adequate coverings. The copper in the wires is more likely to enter the body system than the tiny amount of cadmium. So for there to be any likelihood of harm someone would have to deconstruct the charger, break open the cadmium containg components and deliberately swallow the element. How likely is that? And what about all the millions of electronic engineers who have spent years handling these components safely? Is this yet another example of 'bad science' being taken too far? “could be recalled”. More fake news? Probably have a lot more chance of cancer through a mobile phone, smartphone or smartmeter than a charger. I can only confirm what others have said. As an electrical engineer and a radio amateur I have encountered Cadmium in equipment all my life (so far 70 years) without being tempted to lick it, drink or eat it and so far no harm. Ridiculous hype. In all probability there will be many cadmium plated bolts in the car. Cadmium is a standard coating for steel bolts particularly when used in high temperature service like engine blocks and exhaust systems. An AA size Ni-Cad battery contains around 1g of Cadmium which, at 0.008g each, is the same as 125 Volkswagen battery chargers. If this is a genuine scare then it should be quashed immediately. Where there's the hint of a blame there's a claim... who do I sue about the NiCads on my drill ?